Food mascots have been used in abundance to seduce kids into eating trashy crap while cleaning up on merchandising as well. As time goes on, it seems like food mascots are a thing of the past and something many of us have taken for granted. Here’s a look back into the not so distant past at some of the true gems of the fast food mascot world. Not to be confused with Pizza the Hutt. In the 1990s, where all super weird commercials seemed to be born, Pizza Hut introduced Pizza Head, a slice of pizza that was tortured Mr. Bill style by Steve, a pizza slicer. The commercials were actually pretty funny and Pizza Head was the only mascot that was actually made of the food it was representing. The Mr. Bill aspect was an interesting route to take since it must have been lost on the kids, although the commercials were likely to appeal more to the adults footing the pizza bill. Purveyor of terrible pizza for nearly three decades. Arguably the most recognized and most missed fast food mascot from the 80s-90s is Noid, a weird hyperactive claymation man thing in a sort of bunny-esque costume. The Noid was constantly ruining pizza from other establishments, but Dominos had advanced torture mechanisms in place that would squish the Noid and preserve all tasty Domino’s pizza goodness. 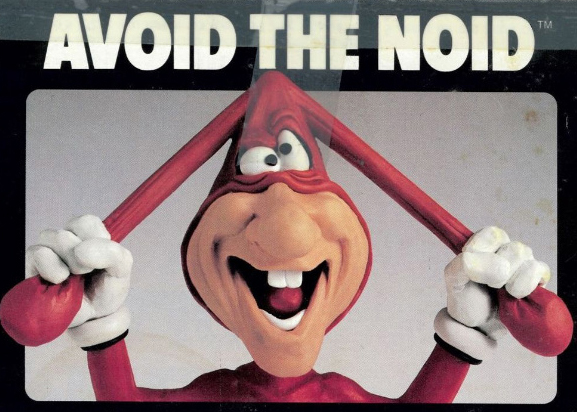 The Noid enjoyed much success and merchandising, including the Avoid the Noid PC game and Yo! Noid for the NES, but not everything was turnin’ up Noid. In 1989, an unstable Domino’s patron named Kenneth Lamar Noid thought the Noid commercials set out to personally attack him and ended up holding up two employees at a Domino’s in Georgia for five hours. For real. This instance may have led to the Pizza Tracker feature implemented decades later. Oh my dear god, kill it with fire! 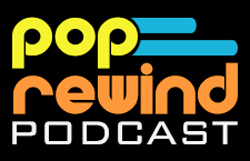 If you weren’t around to see these monstrosities when they originally aired, you’d he hard-pressed to believe that these are real commercials. That aired on TV. For a company. And that someone paid to have these made. Essentially, the Spongmonkeys were the type of Internet memes that existed before we all knew any better. Looking like hamsters with severe birth defects, the Spongmonkeys defy gravity and sing about how much they loved their sodium-infused toasted sandwiches and prove that anyone with Photoshop could be a money-making commercial mastermind. A couple years after the Spongmonkey commercials, a billion (approx. 1,000) Quiznos stores closed. Coincidence? The Great Root Bear… instead of Beer? Get it? GET IT? The Great Root Bear, or Ruddie as I grew up calling him for no apparent reason, was a Canadian creation from 1974. My parents were, and still are, big A&W fanatics and now through the magic of Google, I’ve found out they lied to me about his name for almost three decades. What else in my life is a lie?! 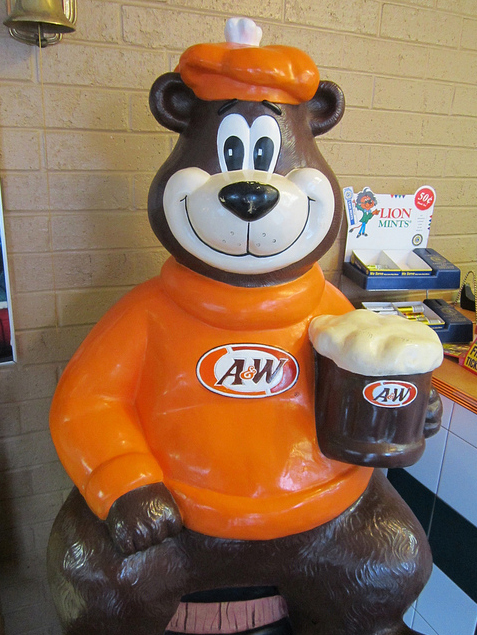 Anyway, the Canadian A&W created The Great Root Bear to compete with McDonald’s, and the mascot ended up being so successful that it was adopted by the American chain as well. The Great Root Bear isn’t completely retired, but has been largely replaced with The Burger Family, consisting of round cartoon faces representing each of A&W’s delicious meaty burger offerings. That certainly didn’t put any kids into therapy. Arguably not fast food, but more of a sit-down entertainment extravaganza, Showbiz Pizza was fronted by three stages of bizarre mascot performers. The main stage featured the core band, the Rock-afire Explosion, consisting of gorilla keyboardist Fatz Geronimo, cheerleader mouse Mitzi Mozzarela, drummer dog Dook LaRue, and beachy bear guitarist appropriately named Beach Bear. Off to left was Rolfe De Wolfe and Earl Schmerle, a comedic duo of a wolf and a yellow puppet thing. 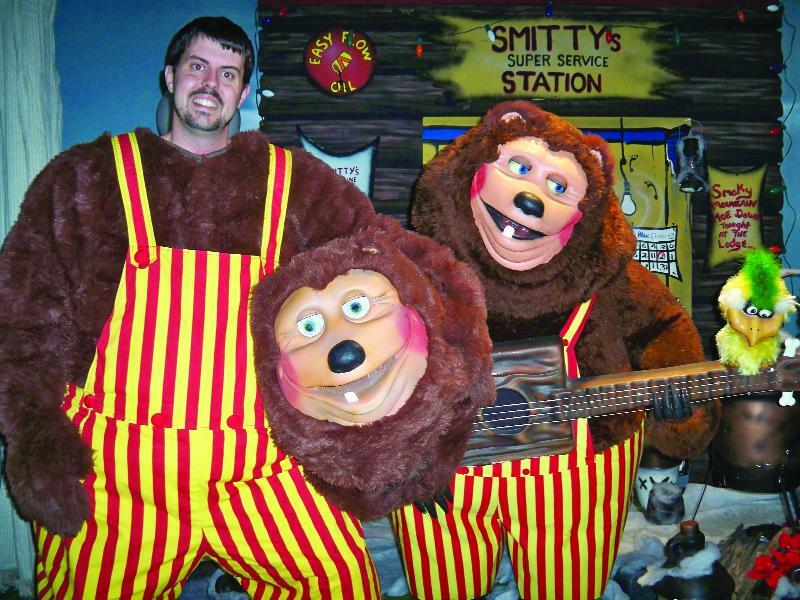 On the right side was giant bear gas station attendant Billy Bob Brockali and Looney Bird who pretty much huffed gasoline during the entire show. Whether or not you were terrified of these giant animatronic creatures (and you probably were at first), chances are you lightened up, enjoyed the show, and shoved crappy pizza down your face. After Showbiz and Chuck E. Cheese became one company, the shows slowly changed over to the Chuck E. Cheese band and then devolved into the one robot show with TV screens you see at the modern versions of these restaurants today. A far cry from what they once were, but Chuck still frightens children. In the late 80s, Burger King revamped their kids meal offerings with a Kids Club and corresponding gang of hooligans to represent said club. 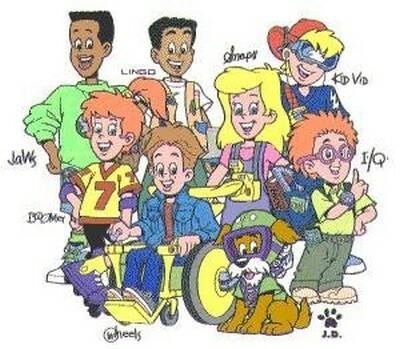 The Kids Club Gang consisted of eight kids all with personalities befitting of their stereotypical look—for example, I.Q. was white and nerdy and Wheels was white and paraplegic. Token kids aside, the Kids Club was pretty sweet—to a 9 year-old, it felt more grown up than those baby Happy Meals over at the competition, and you got free stuff in the mail for your birthday (that also included a free Kids Meal coupon). Yeah, he’s been around the block and came back from retirement only to be retired yet again, but he’s too recent in our memories. That, and he scares the crap out of me. 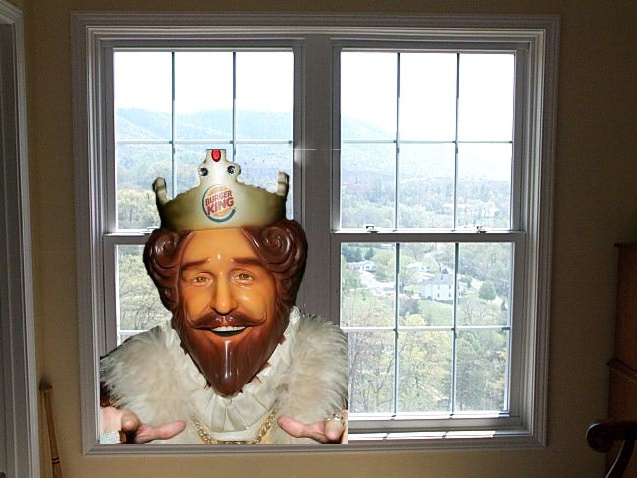 When I hear a noise in the middle of the night, I know it’s the King outside in my bushes. He’s probably outside in yours right now. Sweet dreams. Did we miss your favorite mascot of time gone by? Leave us a comment!